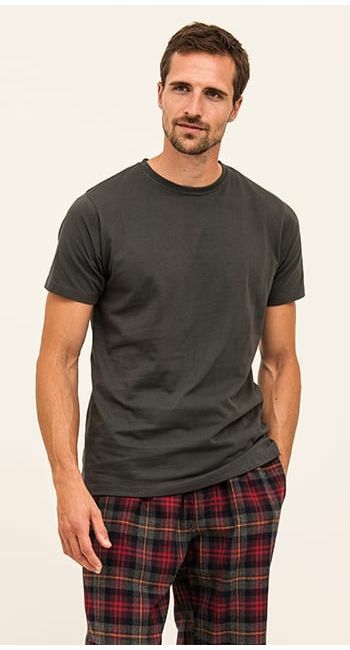 Men's organic cotton t-shirts in plain charcoal grey. After much demand, we are excited to be launching these premium t-shirts for Winter 2018. The luxury mid-weight jersey is knitted in Britain using the highest quality organic yarns. The resulting soft fabric is long lasting, gives a robust fit and is a perfect weight to wear throughout the seasons. Available in navy, light grey marl and charcoal grey. We also have a luxury white supima cotton tshirt in the collection. Fabric type: 100% organic cotton jersey. S 36" - 38" 30" - 33"
M 38" - 40" 33" - 35"
L 40" - 43" 35" - 37"
XL 43" - 46" 37" - 39"
XXL 46" - 48" 39" - 41"
Regular size fits inside leg of up to 34"
Tall size (available in M-XXL) fits inside leg of up to 36" and has two extra inches on the leg length and one extra inch on the sleeves and jacket length. Please note that the inside leg measurements are body measurements, not garment measurements. As a general rule of thumb, men taller than 6'3" tend to need the tall size, but please bear in mind that we are all proportioned differently! Nightshirts: true to generous fit.